I stop, pause, and take it all in. I'm down a cobbled side street with a name I do not know, standing next to a stray cat giving itself a bath and a store selling upcycled handbags and photo frames. I just narrowly avoided being driven into by a guy on a motorbike because my rudimentary French skills extend to the word for "watch out! ", and there's a man beckoning me over to buy some of the most gigantic red strawberries I've ever seen. It's crazy, but it's amazing. It's Marrakech. That moment deep in the twisty alley ways of the old city pretty much encapsulates my visit to Morocco. My senses were swamped with new smells and tastes, my mind whirring with images of dangling lanterns and filled with sundry Arabic words. I walked until my feet were sore, ate the most delicious desserts flavoured with aromatic spices, and marveled at snow-covered mountains. What a place! If you're headed to the city of Marrakech for the first time (lucky you! ), you've got a lot to see, eat and explore. Here are some of my tips and favourite finds to get you started. Marrakech is an incredibly vibrant, colourful and busy tourist-friendly city, with an intriguing mix of influences and traditions, from the local Berber people to Arabic, European and African cultures. While Morocco is an Islamic country, the 'rules' around aspects like alcohol and dress in the city of Marrakech are more relaxed than in other places I've visited in the region. Depending where you're from, it's still likely to be a bit more conservative than your home country (especially if you head out to smaller, rural towns), so try to keep that in mind. For example, some restaurants and even grocery stores in Marrakech sell alcohol, and locals wearing modest Western clothing (sometimes with a headscarf for women) are a common sight. While foreign women don't have to wear head coverings, the general rule of wearing loose-fitting, non-transparent clothing and keeping your knees and shoulders covered will serve you well. The beauty of Marrakech is astounding. You'll see intricately tiled walls, a vast array of exquisite pottery in the markets and decorative arch ways. There are so many smells and tastes, from cardamom and almond pastries to mint tea. Cost-wise, Marrakech wasn't too expensive to navigate (even when travelling on the South African Rand, which had taken a recent knock). Flights are quick and easy from Europe and there are budget airline options that will get you there in 2-4 hours. Visitors from other parts of the world may have to take multiple flights on lengthy or expensive routes (for example, I had to take three flights from Cape Town and fly via the Middle East). In the city itself, prices are negotiable for things like souvenirs and taxis, and shopping at reliable supermarkets like Carrefour can be cheaper than eating out or being charged 'tourist prices' by local shopkeepers. While there are budget accommodation options, I would strongly suggest checking the exact location and reviews on the state of the rooms. Hard-to-find or shabby spots will complicate things (it's very easy to get lost, especially in the old city) and can be risky if you're travelling alone, so it may be worth paying slightly more for a decent hotel. Ask anyone what your first port of call should be, and they'll say "the souks!". The traditional markets inside Marrakech's Medina (old city) are a maze of cobblestone side streets, snake charmers, spices and tucked-away restaurants. I've been to souks in Qatar, the UAE, Oman and Tunisia, but Marrakech's version was a different breed altogether. Starting at the iconic Jemaa el Fna square (it's opposite the Koutoubia Mosque, with its towering minaret visible almost anywhere inside the Medina), you can wander the spiraling alleyways for hours. Stop for a glass of freshly squeezed orange juice from the jovial sellers in carts piled high with fruit. Dodge a monkey on a leash or investigate the henna designs on offer by women in the square. It's busy and noisy and beautiful and kind of crazy, and it becomes even more so at night. In the warrens of the markets, there are stores selling everything from gorgeous Moroccan lanterns to detailed pottery, clothing, traditional tea pots and souvenirs like post cards and key chains. There are rarely fixed prices - if you ask the shop owner, they'll reply with "How much do you want to pay?". If you can get them to state an opening price, the general rule is to barter them down to a third of that. Otherwise find a middle point where neither of you feel like you're being ripped off. The Medina is also home to many of Marrakech's cafes and restaurants, as well as cultural attractions like the Maison de la Photographie de Marrakech (Marrakech's house of photography) and Palais de la Bahia. These offer a respite from the busy streets, and are worth a visit to see the beautiful palace courtyards and glimpses of life in Morocco in decades past. The Palace's stunning floors and ceilings really inspired me, and the tall, white building that houses the photography museum is lovely to wander around. 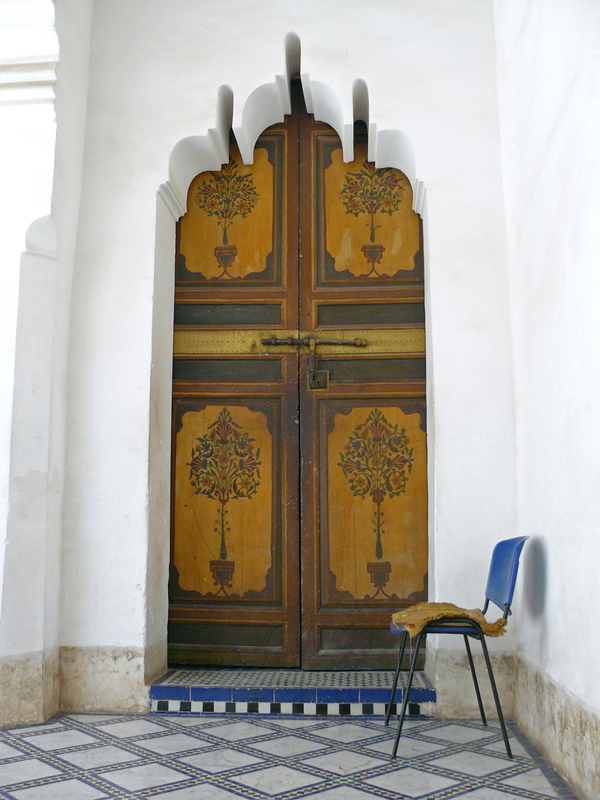 If you're into the darkly fascinating, you can also visit the Saadian Tombs to marvel at the artfully decorated tombstones and rooms housing the remains of the former ruling family. Another point of interest is the Koutoubia Mosque, which is surrounded by lovely gardens, should you care to pause your explorations for a while and take a seat. Started by an artist and lover of botany in the 1920s, Jacques Majorelle's garden gained wider fame after it was purchased by French fashion designer Yves Saint Laurent and his partner, Pierre Bergé, in 1980. Since then, the garden and its buildings have been restored and upgraded. They're now open to those looking for a retreat from the bustling streets of Marrakech. The bright, cobalt blue colours of the structures in Jardin Majorelle make this an eye-catching stop. While the part that is open to the public is relatively small (the main house is off-limits), there is still a lot to see, beyond the hundreds of plant species collected from around the world. Walking underneath a bamboo canopy, you can wander between the water features or memorial to Yves Saint Laurent and stop off for some lunch at the café. Jacques Majorelle's studio has been transformed into a museum documenting the history of the local Berber people, and is accompanied by a small gallery and boutique shops. Take a short drive out of Marrakech, and you'll find the Ourika Valley in the folds of the Atlas Mountain range. Dotted along the winding mountain passes are stores selling handmade wares, from Argan oil to carpets and cooking pots. The road falls parallel to a river, allowing stunning views of the gorge created in between the peaks. Here, you can head out for a walk in the valley (it was snowing when I went in February), or stop off at one of the rustic traditional cafés for some local tagine (vegetables or meat cooked in a pointed pot). Reaching many of them involves crossing a rope-and-wood bridge that looks like it was plucked from an Indiana Jones movie, so pack some snacks if you'd rather not take the risk. Along the way, you can visit a traditional Berber house, or stop at an Argan oil shop to see how an indigenous Moroccan fruit is transformed into the liquid that has become a force in the cosmetic industry. Be warned: prices in tourist areas in the valley are often higher than in town or at the souks, so plan your purchases carefully. When I was researching Marrakech, the three things I kept hearing about (and made a note to sample) were mint tea, tagine and fresh orange juice. With very little effort on my part, I'd tried all three within two days of arriving in Morocco. Marrakech provides so many options for plant-based eaters, from tagines and couscous to Moroccan salads, that I was spared my usual concerns about finding meat-free food. Even the salads were a level above the usual lettuce-and-a-sad-tomato variety I'm usually served, as they comprised everything from grilled eggplant to sweet potato, roasted courgettes and something that was orange and delicious. Veggies, you'll be fine. 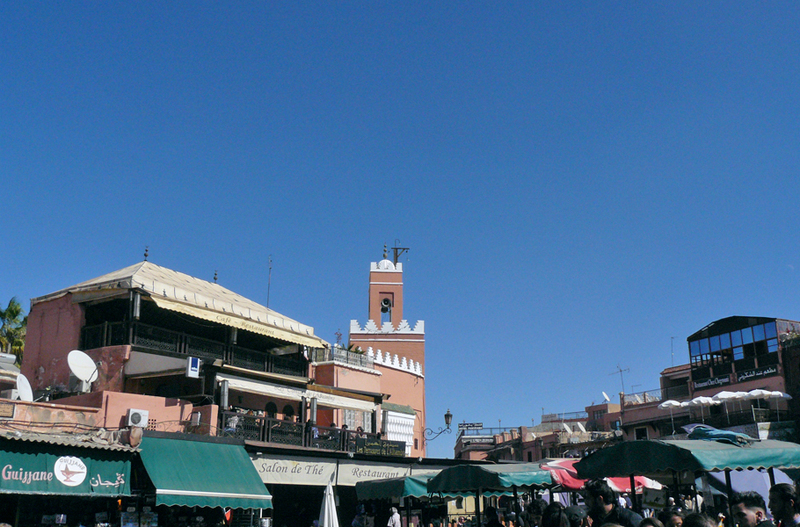 Traditional food is everywhere in Marrakech - and the Medina is a hub for incredible restaurants. I really enjoyed eating at Art Place, which is located on the fringes of the Jemaa el Fna square. It offers local tagines, cous cous, briouates (pastries) and salads in a beautifully decorated setting overlooking the bustling square. For a really decadent Moroccan meal, Dar Essalam is a bit further down a side-street, but it's worth investigating. This lovely restaurant is located underground, and offers local delicacies and dishes in rooms so stunning they were used to film movies in. For more contemporary cuisine, try Nomad, a stylish spot offering comfy roof top seating and a modern Moroccan menu. Café Clock is also a brilliant option. I loved their trendy roof top area, wall murals, welcoming staff and vegan and vegetarian friendly menu (Date milkshakes! Falafel! Fig and blue cheese salad!). They also offer music and story-telling nights and Moroccan cooking classes, which my travelling companions raved about for days afterwards. I didn't attend, but was lucky enough to sample the final yummy products. If you've thoroughly explored the city and are looking for a good day trip, I highly recommend venturing out over the mountains towards the village of Aït Ben Haddou and nearby Ouarzazate. It's a very long drive (around 4 hours each way), but the scenery is stunning. Once you're outside Marrakech, you'll start climbing the slowly elevating roads that lead you to the Tichka mountain pass. The views of the Atlas Mountains (especially in winter, if it's snowed recently) are magnificent, although the twisty road and hairpin bends may make you want to close your eyes. It's definitely not a journey to be made in bad weather or in the dark, so make sure you leave enough time to get back to the city before sunset on your return journey. Once you've left the mountains, you'll transverse the fringes of the Sahara desert and arrive at the Aït Ben Haddou Kasbah, a UNESCO World Heritage Site and stopping point for generations of nomads and their caravans of camels. This ancient city clings to the rock face, and its mud-and-clay structures have served as fantasy cities for Hollywood. From Indiana Jones to Lawrence of Arabia, The Mummy, Gladiator, Game of Thrones and Prince of Persia, the local guides will tell you the history of the village, alongside stories of how they starred as extras and helped the production crews when they came to town. The neighbouring town of Ouarzazate houses the studios that worked on these movies and television shows, as well as the Taourirt Kasbah, another film location. Whether you're a movie fan, cultural junkie, artist or experimental eater, Marrakech serves it all with flair. I'll be dreaming of those hand woven carpets and mosaic ceilings for many years to come. Interested in exploring more beyond the borders of the city? Take a look at my post on what to do and see in and around the Atlas Mountains. Some of the most beautiful places to stay (that you've probably seen on Instagram) are called riads - they're traditional Moroccan homes with stunning interior courtyards. A number of these operate as guest houses or are available to rent in their entirety on sites like Airbnb. If you'd like to go that route rather than stay in a hotel, double check the location and ask for directions if you can - it's very, very easy to get lost. While you can book tours and day trips online, I found cheaper options available through my hotel's reception staff. A lot of the hotels have partnerships with tour operators, so will come fetch you directly from where you're staying, and you know they probably do a good job (since the hotel keeps them on speed dial). If you're venturing out into the mountains, consider going through a tour company. Some of the roads are very narrow with sharp drops off sheer cliffs (and can get snowed in during the winter months) so travelling with a guide who knows them well can be safer than heading out in a rental car yourself. There are some areas which can be a bit overwhelming or neglected (think crumbling sidewalks, littered streets and uncomfortably persistent salesmen in the markets). Don't be afraid to take it slow or venture out in a group if you think it'll be too much for you to take in alone. Say "la shukran" or "non, merci" (no, thank you) firmly to people pestering you.